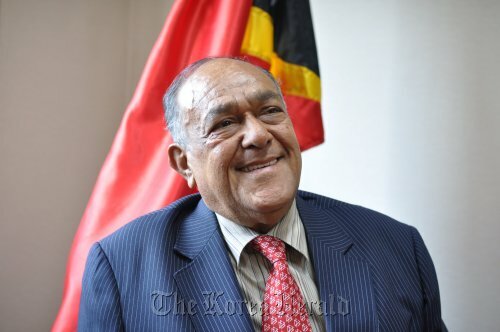 The East Timor Ambassador to Korea Joao Viegas Carrascalao has died of a heart attack, embassy officials said Tuesday. He was 66. Staff at the embassy said that he died on Saturday at 1:40 a.m. at his home in East Timor, to which he had recently returned. He was then pronounced dead at the Guido Valadares National Hospital. He had been suffering ill health for some time. “The main reason for his death was a heart attack. He was in a dire, dire physical situation and he had been struggling because of that,” staff at the embassy in Seoul said Tuesday. The president of the republic, Jose Ramos-Horta, paid his condolences following the death. “Although, Joao Carrascalao was suffering from ailments such as diabetes, heart and kidney conditions from a very long time, he continued to serve Timor-Leste (East Timor) as the ambassador to Republic of South Korea,” read a statement from the president’s office in the capital Dili. Born in Liquisa on Aug. 11, 1945, Carrascalao fought for his tiny nation’s freedom from Indonesian rule, playing an active role in the diplomatic movement. He helped found the Timorese Democratic Union Party in 1975, which launched coup in August that year. He then lived in Australia when Indonesia continued its occupation. At least 100,000 Timorese reportedly died as a result of the 25-year occupation. After island-nation finally gained independence in 2002, Carrascalao became president of the country’s National Olympic Committee and member of the State Council. He served as minister of infrastructure and ran for president in 2007. He was East Timor’s first ambassador to Korea from 2009, and was married to Rosa Maria Carrascalao. Portuguese ambassador Henrique Silveira Borges said he will soon pay his respects to her at the East Timor embassy in Seoul. “Myself and my wife very much regret his passing as we were very close friends. Although Portugal and East Timor are quite far apart geographically, we are linked by our history,” he said of the former Portuguese colony.